Perhaps it is because as a child, I witnessed Zaggy torturing chubby Butterball every morning at the school bus stop. Consequently, I have an extremely low tolerance for Leftists bullying Americans into submission and getting away with it. Fear caused Butterball to endure daily humiliating facial slaps, punches and extortion of his lunch money. Frustrated for Butterball, I asked, "Why don't you hit Zaggy back?" Butterball replied, "He will beat me up". My retort, "He is beating you up every day!" One morning to the delight of us kids, Butterball, while crying his eyes out, went wild on Zaggy. Nothing seriously violent, but Zaggy was the one crying and afraid. My fellow Americans, we are being bullied like never before by Leftists which include Obama and the MSM. We are being forced not only to tolerate, but embrace their liberal far-left radical socialist/progressive agenda. Their agenda is particularly hostile towards Christians, the unborn, American traditions and exceptional-ism. Noncompliance or opposing points of view are not tolerated; either total submission or suffer total destruction. Christian twins, Jason and David Benham had their Home & Garden Television (HGTV) show, "Flip it Forward" canceled when the Left learned that the brother's faith based views were not in step with the Left's mandated thinking. Even though the twins proclaimed their love for all people and vowed never to discriminate, it still was not good enough for the Left. Every American is required to agree or suffer the consequences. Like many Americans, my black brother is a low-info voter. He is not politically engaged and gets his news from the MSM. Consequently, he was not up to speed on the Hobby Lobby case. He was shocked to learn that the case was really about the Obama Administration attempting to bully the business into betraying its Christian faith. He was stunned learning that Hobby Lobby provides 16 of the 20 contraceptives mandated in Obamacare, only refusing to fund the four that kill babies. He replied, "Wow!" 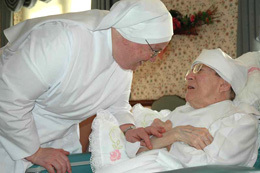 It is chillingly evil to call sweet humble elderly nuns who provide loving care for seniors in the late stages of life, "dirty." Nothing could better illustrate the sick and depraved mindset of this vile organization. http://bit.ly/VhFM6N Like harden mercenaries, Leftist operatives take no prisoners. Furthering their agenda trumps common sense, compassion and decency. Is this the behavior of true advocates for black empowerment or plantation overlords committed to keeping blacks under their thumb of dependency? Master connivers, deceivers and manipulators, the Left portray themselves as victims of intolerance while they bully us into submission under the radar; emboldened under Obama. We are living in a very scary time in America. So how do we defeat Leftist bullies? Like battered chubby kid Butterball, we decide enough is enough. We go politically wild on them, sending them packing, crying and afraid.